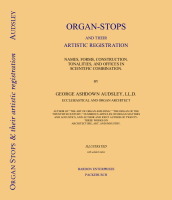 Description: This book contains descriptions, construction details, and offers ideas for the use of the various stops or voices in an organ. To supplement the volume, a completely new index of names and places has been added. Audsley, George Ashdown. Architect, organ designer, and writer. Gained an interest in organ construction in 1865, building one in his house. Moved to New York, U.S.A., 1892. b. Elgin, Scotland, Sep. 6th, 1838; d. Bloomfield, New Jersey, U.S.A., June 21st, 1925.